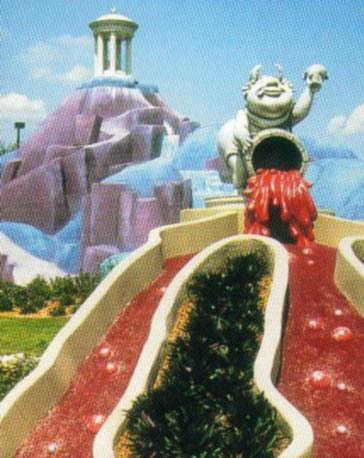 Since the first putt was stroked in 1996, Fantasia Gardens has been a showering, giggle-inducing diversion to guests young and old alike. The underestimated popularity of miniature golf, expected attendance during its first week of operation was 800 to 950 putters per day, well over the 400 to 600 estimated guests, spawned the creation of other courses down the road at Winter Summerland. 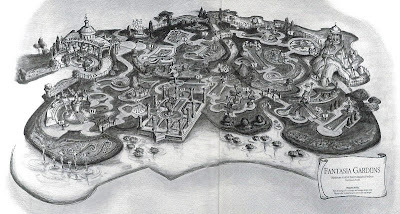 In the planning stages concepts such as Roger Rabbit, Alice in Wonderland and Storybook Land were discussed, but in the end, the idyllic scenes set by Fantasia won out. The story of Fantasia Gardens was broken down into five distinct stories (with a quick nod to Night On Bald Mountain): Toccata and Fugue, The Nutcracker Suite, The Pastoral Symphony, Dance of the Hours, and The Sorcerer’s Apprentice. With the muted backdrop of a garden Fantasia segments such as Rite of Spring found themselves on the outside looking in, as a tromping dinosaur appearing near a pirouetting ostrich could have made for an uncomfortable disconnect. With the gardens selected, an appropriate weenie could be sought out. Fittingly, the home of mighty Zeus was selected. Mount Olympus complete with a columned palace draw the eyes of passerbys and golfers alike. Unfortunately, the home of Zeus, perched atop Olympus, vanished several years ago, but the spirit of the mountain still remains. 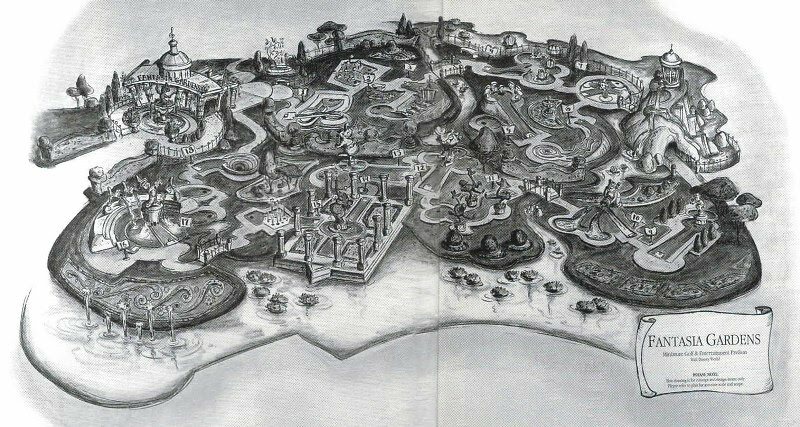 I feel like it is time for me to head out and pick up my putter, so I’ll leave you today with this concept illustration of Fantasia Gardens, which comes pretty close to the course that can be played today.